Ht / Wt: 5'10" / 185 lb. 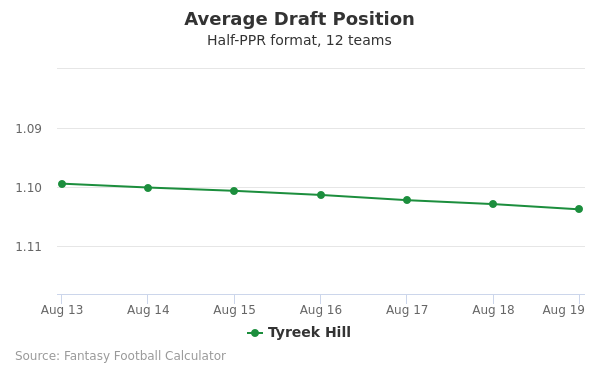 Tyreek Hill's fantasy value is measured by his average draft position (ADP) in fantasy football mock drafts. 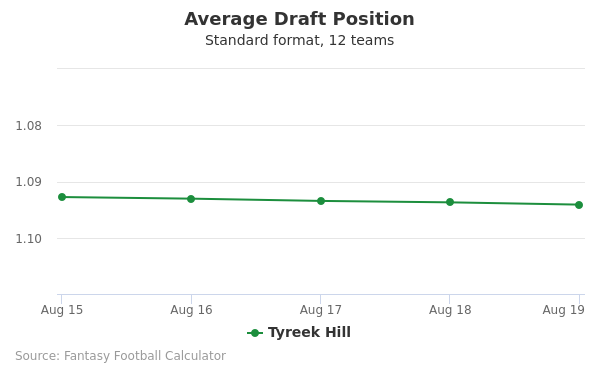 In recent drafts, Hill's current ADP is 2.04, which indicates that his fantasy outlook is to be the 4th pick of the 2nd round, and 16th selection overall. 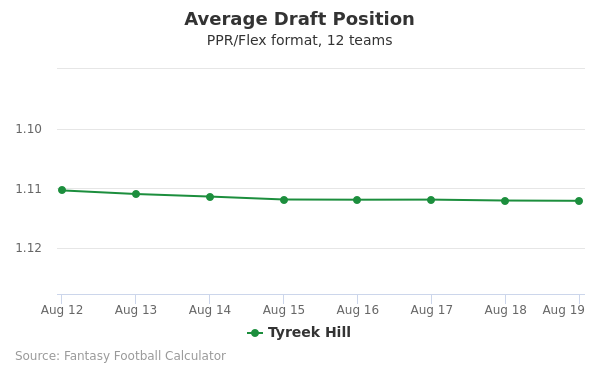 The code below will display a graph that updates every day to show the ADP data for Tyreek Hill for the past 30 days in 12-team PPR leagues. Draft Dalvin Cook or Tyreek Hill? Draft Travis Kelce or Tyreek Hill? Draft JuJu Smith-Schuster or Tyreek Hill? Draft Antonio Brown or Tyreek Hill? Draft Nick Chubb or Tyreek Hill? Draft Pat Mahomes or Tyreek Hill? Draft Mike Evans or Tyreek Hill? Draft Marlon Mack or Tyreek Hill? Draft Tyreek Hill or Zach Ertz? Draft Damien Williams or Tyreek Hill? Draft T.Y. Hilton or Tyreek Hill? Draft Leonard Fournette or Tyreek Hill? Draft Adam Thielen or Tyreek Hill? Draft Sony Michel or Tyreek Hill? Draft A.J. Green or Tyreek Hill? Draft Keenan Allen or Tyreek Hill? Draft George Kittle or Tyreek Hill? Draft Mark Ingram or Tyreek Hill? Draft Aaron Jones or Tyreek Hill? Draft Amari Cooper or Tyreek Hill? Draft Phillip Lindsay or Tyreek Hill? Draft Derrick Henry or Tyreek Hill? Draft Stefon Diggs or Tyreek Hill? Draft Aaron Rodgers or Tyreek Hill? Draft Devonta Freeman or Tyreek Hill? Start Antonio Brown or Tyreek Hill? Start Pat Mahomes or Tyreek Hill? Start Mike Evans or Tyreek Hill? Start Marlon Mack or Tyreek Hill? Start Tyreek Hill or Zach Ertz? Start Damien Williams or Tyreek Hill? Start T.Y. Hilton or Tyreek Hill? Start Leonard Fournette or Tyreek Hill? Start Adam Thielen or Tyreek Hill? Start Sony Michel or Tyreek Hill? Start A.J. Green or Tyreek Hill? Start Keenan Allen or Tyreek Hill? Start George Kittle or Tyreek Hill? Start Mark Ingram or Tyreek Hill? Start Aaron Jones or Tyreek Hill? Start Amari Cooper or Tyreek Hill? Start Phillip Lindsay or Tyreek Hill? 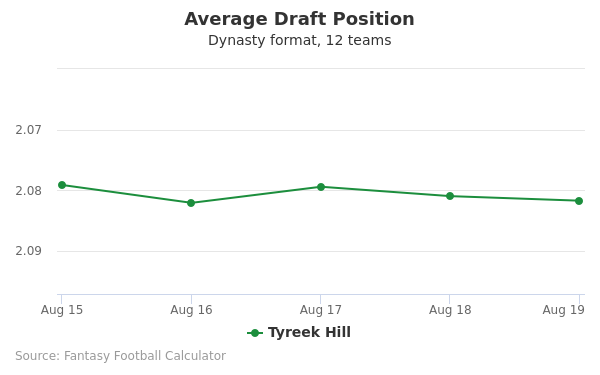 Start Derrick Henry or Tyreek Hill? Start Stefon Diggs or Tyreek Hill? Start Aaron Rodgers or Tyreek Hill? Start Devonta Freeman or Tyreek Hill? Tyreek Hill is a wide receiver and kick return specialist for the Kansas City Chiefs. Hill had a volatile college career, that included him attending three different schools. The Chiefs were said to be taking a risk on drafting him, but they did, and he emerged as one of the team's most explosive weapons in the just completed season. He started his college career at Garden City Community College, running track and playing football. As a sophomore he started to catch on in football, running for 659 yards and five touchdowns, with 532 yards receiving. He signed with Oklahoma State and started the season with 62 yards receiving. He returned a punt 92 yards against arch rival Oklahoma to help the Cowboys defeat the Sooners. He had 1,811 all purpose yards, and six touchdowns. His 996 return yards was second in the nation. After one season he was dismissed by Oklahoma State. He finished his college career at West Alabama. Though Hill was an obvious talent, no one thought he would be drafted because of his legal problems. He had pled guilty to choking his girlfriend while at Oklahoma State. He was not invited to the NFL Combine, but performed at West Alabama's Pro Day. Hill's 40 time was 4.29 with a 20-yard split of 2.15 seconds. His vertical leap was 40 and a half inches, and his broad jump was 10 feet, nine inches. He was eventually drafted in the fifth round by the Kansas City Chiefs. Since Hill was drafted so low, he did not get a high dollar salary from the Chiefs. His reported contract for his rookie year was worth $497,500. Hill had a breakout season in his rookie year. He started the season as the first team punt returner, and as the fourth receiver. He finished the year with 61 catches for 593 yards and six touchdowns, 267 yards rushing and three touchdowns, and 384 yards returning kicks with one touchdown. He was named to the 2017 Pro Bowl as a return specialist, and was also all pro as a returner. His first catch of his career was for a touchdown in the opening game. In one game he had 89 yards receiving, which was a season high. In November he returned a kick 86 yards for a touchdown. In that game, he was the first player to score returning, receiving and rushing in the same game since 1965 and was named AFC Offensive player of the week as a result. He was named special teams player of the year twice during his rookie season. During one of his punt returns for a touchdown, he reached a speed of 22.77 miles per hour, which was the fastest recorded by anyone during the season. After the season was over, the Chiefs were considering putting him into the starting lineup as a receiver, while continuing his kick returning duties. Hill was dismissed at Oklahoma State after the regular season, and before their bowl game, on domestic abuse charges. While at Oklahoma State he was accused of choking his girlfriend who was pregnant at the time. He ended up at West Alabama after that, and the West Alabama coach said he at first turned Hill down, but later accepted him. The Chiefs were well aware that someone with a domestic abuse charge would create some controversy, and they held a press conference to address the issue after the draft. Hill has accepted responsibility and is paying to support the woman and her child.